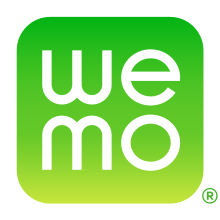 WeMo is a series of products from Belkin that enable users to control home electronics remotely. The product suite includes electrical plugs, motion sensors, light switches, cameras, light bulbs, and a mobile app. The WeMo Switch can be plugged into any home outlet, which can then be controlled from an iOS or Android smartphone running the WeMo App, via home Wi-Fi or mobile phone network. The WeMo Motion Sensor can be placed anywhere, as long as it can access the same Wi-Fi network as the WeMo devices it is intended to control. It can then turn on and off any of the WeMo devices connected to the WiFi network as people pass by. The WeMo Insight Switch provides information on power usage and cost estimation for devices plugged into the switch. The WeMo Light Switch is for use where a light is controlled by a single light switch. Multi-way switching is not supported at this time but can be approximated by installing a WeMo Light Switch at each location. The WeMo App controls the WeMo devices from anywhere in the world as long as the WeMo devices' wireless network is connected to the Internet. WeMo devices can also be controlled using IFTTT technology. WeMo devices can also be controlled by voice through the Amazon Echo, Google Assistant, and Apple's Siri (through the use of the WeMo Bridge). WeMo switches are controlled via IP networks; thus, for a switch to be controllable from a remote location, it must be open to receive connections from the Internet. In January 2013, it was revealed that the WeMo had a security flaw in its UPnP implementation that allowed an unauthorized user to take control of a switch. This could allow malicious attacks, such as flipping the switch at a very fast rate, which could damage certain devices and even cause electrical fires. This vulnerability has been addressed by updated firmware releases. ^ Crist, Ry (2015-04-08). "Amazon Echo enters the smart home with support for WeMo and Hue". cnet.com. CNET. Retrieved 2017-02-09. ^ Cipriani, Jason. "CES 2018: Belkin's Wemo line gains Apple HomeKit support". ZDNet. Retrieved 2018-03-26. ^ Brian Benchoff (2013-01-31). "Turning the Belkin WeMo into a deathtrap". Hackaday. Retrieved 2017-02-09. ^ "Vulnerability Note VU#656302 - Belkin Wemo Home Automation devices contain multiple vulnerabilities". Kb.cert.org. Carnegie Mellon University. 2014-07-29. Retrieved 2017-02-09. This page was last edited on 26 March 2018, at 17:47 (UTC).